Today is a big day! After four years studying music business at Belmont, and eight years working at record labels, I have left the music industry. It’s bittersweet. I came to Nashville to work in music, and I had a great time. I learned a lot, got to work with some fantastic people, met some cool artists, went to some awesome shows, was part of the birth of the digital music industry, and traveled to some of my favorite cities. But life changes, and priorities do with it. For the last several years I’ve had the opportunity to be on the front lines of an online startup my good friend Brian founded with his brother, Mark. As the company has grown, so has my role with them, and we’re at a point now where I am finally able to join the team full time. What does this mean? Well, I get to work from home, for one – amazing, especially considering Eli is just two months old now! It also means I’ll be handling marketing for the company, helping us grow our brand and find new clients. It also means I have a ton of work to do. It also means I need to learn a thing or two about marketing. Last week was a nice ending to my music days. 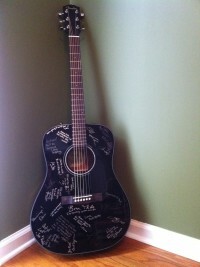 Went out to eat with my friends and then they gave me a guitar signed by everyone in the company. Pretty awesome, and I’m glad to know I have friends that will last beyond the 9-5 framework of corporate life. So, here’s to new beginnings and to hoping we don’t see a repeat of the 90’s dot-com bubble bust. Yaaaaaay!!! New beginnings!! A new guitar! And another chance to be a morning person! Congrats Matt. Will the black guitar get played? I’m sure Eli will enjoy it.